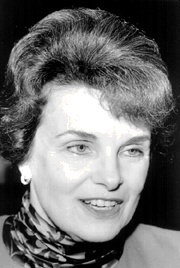 Conservative Democrat, her political career was on the verge of collapse after several failed attempts to gain higher office, she took over as mayor after the assassination of Moscone. After she survived an unpopular 1982 recall election called by the obscure White Panther Party over her attempts to establish handgun controls (she won the election by 82-18%) and won re-election, she went on to become U.S. Senator, elected in 1992. Played over-enthused hostess and demure rising star to the Democratic National Convention in 1984, one of the first tenants in the new Moscone Center. She dismantled the neighborhood orientation of the Moscone administration and facilitated the construction boom in downtown San Francisco in the early 1980s. Succumbed to blackmail by representative Tony Coelho in 1984, signing long-term contracts (through 2015) to sell city owned electricity to Coelho's district's water utilities at just over cost (see Water). “...Any politician who's been running for office for 25 years collects a baggage car full of contradictions. But Feinstein pulls a freight train. The darling of the gay community who vetoes domestic partners and lobbies against testing AIDS drugs. The pioneering woman candidate who refuses to commemorate Roe v. Wade because such an action might "arouse controversy." The idealist who once wrote: "There is no moral or religious ground that gives you the right to terminate the life of another human being," transformed into just another 1990s death penalty fanatic. “...She's always been about money. It was there for her when she was born. She kept marrying more of it. And, in her campaigns, it has flowed like Sacramento Delta water in a year of Sierra rain. Money is really the best place to start in revisiting Dianne Feinstein's political career. “It was 1969 when Feinstein first put together the combination that has marked her success ever since. Spending an unprecedented $75,000 -- at a time when a three-bedroom house in a comfortable San Francisco neighborhood cost $28,000 -- Feinstein finished first in a field of 16 candidates for San Francisco supervisor. She was the first San Francisco politician in history to use the expensive -- and inefficient, given the communities reached and not voting -- medium of television advertising. “Her contributions were led by a wealthy father, an even wealthier husband, and a constellation of powerful business leaders who -- correctly -- assumed that she would be a safe vote for their interests. As supervisor and mayor, she was an unabashed cheerleader for the easy-money game of downtown office building construction. 30 million soulless square feet were added during her administrations. Her corresponding neglect of community interests can still be visited at a symbolic vacant lot in Chinatown, once the site of the International Hotel. A home for elderly Filipino immigrants and their community center, the hotel was demolished 17 years ago at the behest of corporate developers backed by Feinstein. Like her promises to the community at the time, it still sits vacant. “Subsequently, as a member of the Advisory Committee for Adult Detention in San Francisco, she was, according to a recent biography by San Francisco Chronicle political writer Jerry Roberts, "a familiar visitor in the jails, wearing her I. Magnin outfits and clicking through the stone corridors on her high heels." Then, as now, the San Francisco jails were a fetid hell-hole. But reports and studies by the "crime" committees and other "concerned citizens" produced basically changed nothing for the incarcerated. Instead, they served to reinforce the political power, social privileges (current average annual salary: $60,000) and occasional unpublished brutality of the San Francisco police department. Feinstein, and her allies, were emphatic supporters of an increasingly militarized police department. Quite logically the police become their obvious first line of defense during times of social stress when privileged classes feel most threatened. Feinstein's chosen electoral year, 1969, was certainly one of those times... 250,000 people marched in San Francisco against the Vietnam War just two weeks after Feinstein's election. On the morning after election day, the "dark-haired, blue-eyed beauty" opened her Pacific Height's door to a Chronicle reporter, who gushed at the "long-stemmed American beauty roses everywhere, in proper containers, on highly-glossed antique chests and tables." The journalist concluded that, "If her elegant superbly decorated English homes is any indication, quiet and order will be keystones of Mrs. Feinstein's political career." But "quiet and order" were the last things that one would attribute to Dianne Feinstein's subsequent, endlessly ambitious, political career. In fact, hardly was the lettering on her Board of Supervisors nameplate dry after her inauguration in 1970, when she decided to create a major political commotion, and run for mayor of San Francisco in 1971. 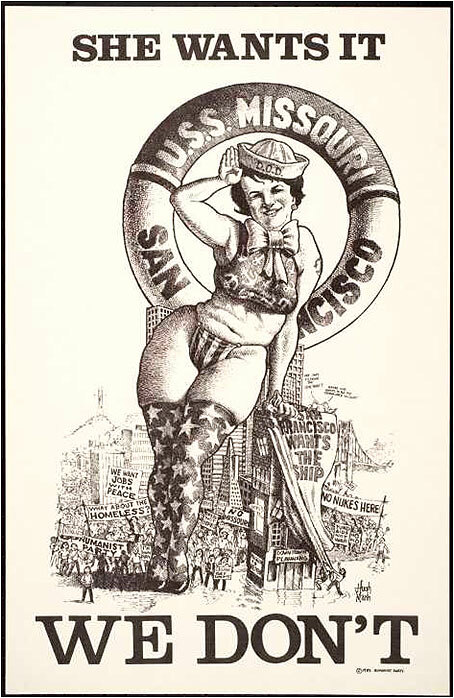 Poster lampooning Dianne Feinstein during her mayoralty for her support of homeporting the USS Missouri in San Francisco.